The “one big idea” chosen was the idea of a transportation-specific tax, possibly connected to a referendum, using Los Angeles County’s “Measure R” as a template. 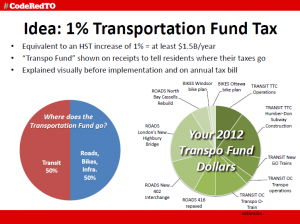 A 1% increase in the Ontario HST province-wide, dedicated to transit, road, and bike infrastructure, would net about $1.5B per year and should be designed to bring funding back into every community in a consistent and non-partisan way. Our presentation began with a mention of specific transportation issues in committee members’ ridings, which drew nods from all parties as they clearly understood the funding problems their constituents often face. During the question segment, a representative from each of the PCs, the Liberals, and the NDP expressed their thanks for the engaging and clear presentation. They then asked questions based on either genuine interest or political hobby-horses, depending on one’s preferred party. Our response: Toronto is one of the only cities on the planet that uses only buses and subways. [Not said: Streetcars in this question function as buses, in that they are slow and low-capacity compared to the modes in question.] Every other advanced transit system uses a mixture of modes for different situations. We advocate for the right technology in the right place at the right time, and we want better rapid transit options for more residents, sooner. Sometimes that means LRT, sometimes it means subways, sometimes it means neither. Our response: no, this is not meant as a formal proposal and though we have heard strong messages of support from outside Toronto and Ottawa, this has not been formally measured. That is very far outside our areas of expertise, and while we want more rapid transit sooner, and AFP approaches have worked well in Europe but perhaps less well in North America, we have no opinion on this as we don’t have the expertise. Yes, in that we think there are many methods to gather revenue that should all be explored and used, rather than sticking to just one revenue generator. CodeRedTO was happy to be able to present, and we mentioned in our presentation and reiterate here that we receive no funding or talking points from any political party, group, or elected individuals. We are happy to bring presentations of varying lengths about light rail, about transit expansion, about the pros and cons of various technologies and designs, to any public meeting should an MPP (or anyone!) like to invite us.